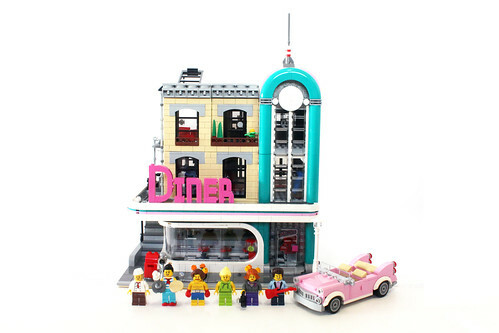 As tradition at the beginning of the year, LEGO releases a new modular building and for 2018, we have the LEGO Creator Downtown Diner (10260). I’ve read many comments saying that it is a substantial change from the architectural style we’ve had before but there are also fans that welcome the change as it is different from what we’ve previously gotten. 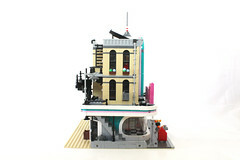 The Downtown Diner consists of 2,480 pieces and retails for $169.99. The contents of the box include twenty bags, numbered from one to five, a 200 page instruction book, and four loose 8×16 dark gray plates. 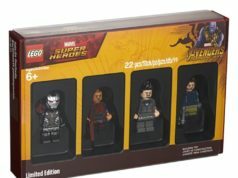 There are six minifigures in this set and one notable change is that they all have expressions on their faces instead of the traditional smiley faces. It’s sad that LEGO has decided to make this change but they stated that they wanted to explore using expressive faces and it looks like that will continue on for next year’s set. 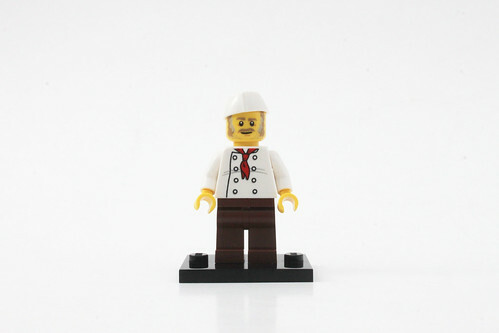 The chef is named Jim, according to the Diner door, and he wears a simple white chef’s coat with a red scarf for the torso and an angled cap to finish his look. The head shows Jim with some dark tan mutton chops. The waitress is dressed like the old-school style waitresses who has on roller skates to serve guests. The torso is printed with a blue and white striped shirt with a red scarf. 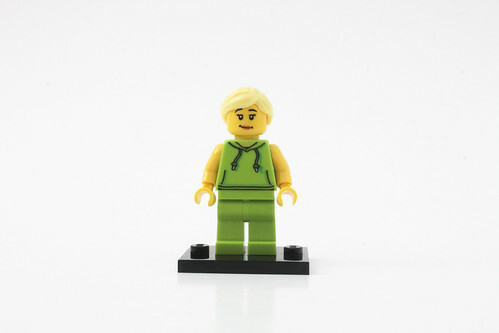 Her ponytail hairstyle is the same one as the Diner Waitress from the Series 11 Collectible Minifigures but in black. As stated before, she has a pair of red roller skates on her feet. 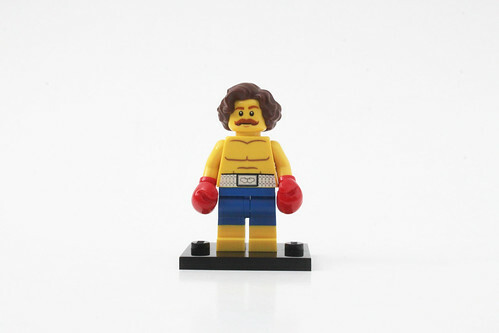 The boxer shows off his muscles on the front of the torso along with printing of a belt on the waist. 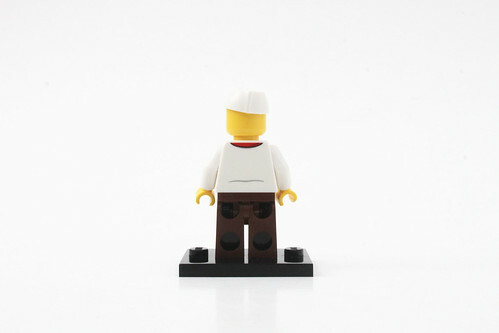 The back of the torso is bare which is unfortunate. 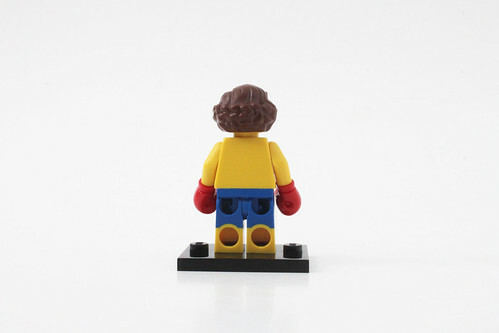 There are a pair of red boxing gloves that are in place of the hands. 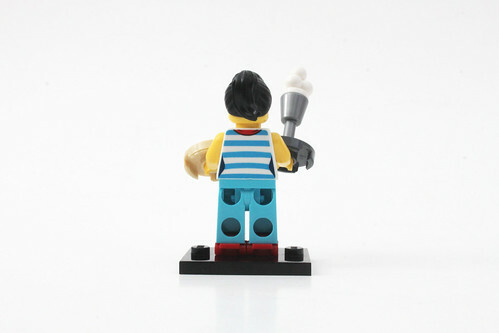 The legs are dual molded with some blue shorts. His face shows him with a ginger-colored moustache. To finish his look, he has a large wavy hairstyle. The bodybuilder has on a basic green tracksuit with a hoodie. She has a double-sided head with a smile on one side and an exhausted expression on the other. The hairpiece is a simple blonde ponytail. 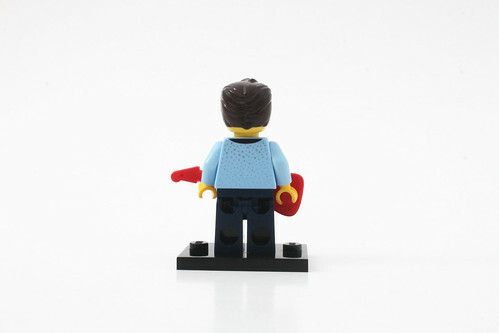 The rock star wears a blue jacket over a pink shirt and dark blue cummerbund. It’s basically what you would see Elvis Presley would wear back in the day. He has a double-sided head with a smile on one side and a singing expression on the other. I do like the dark brown hairstyle that he has and is another throwback to Elvis. 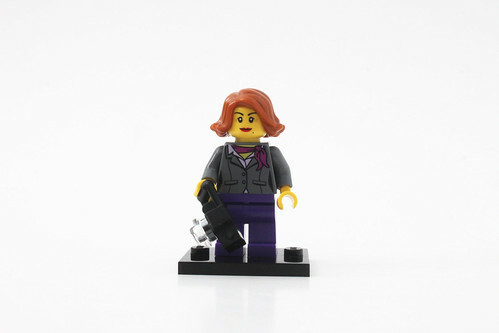 The manager is probably the most generic looking minifigure from this set. She has a dark gray jacket with a purple scarf for the torso. She has a smile on one side of the face and an angry expression on the other. 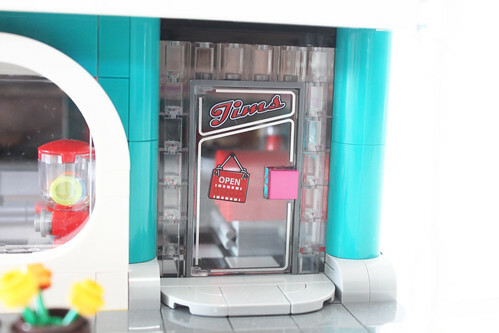 The first floor consists of Jim’s Diner. 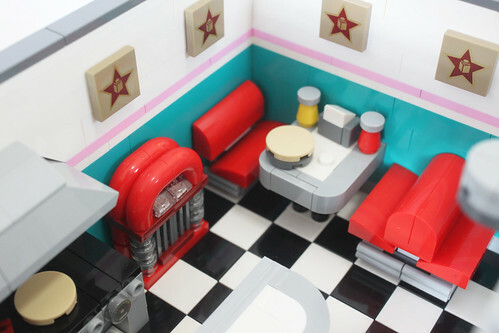 One thing you’ll immediately notice is the clean checkered floor that is synonymous with diners. 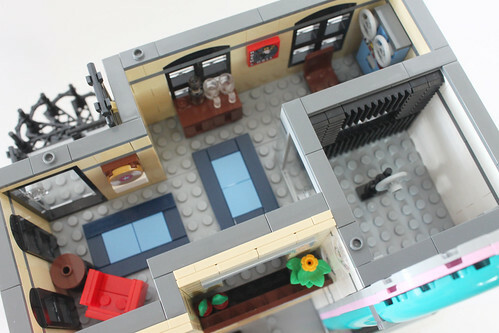 The layout goes from the front seating area all the way to the kitchen. At the counter, there are a couple of red stools, which again, fit into the whole nostalgic scene. Against the side wall is a couple of booth seats and a table that is complete with napkin dispenser, mustard, and ketchup and some uneaten pancakes. Also along the back wall is a nice looking jukebox. 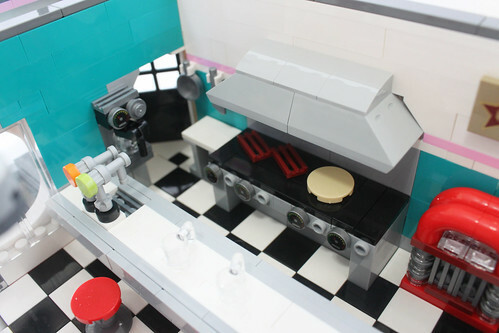 For the kitchen area, there a large double stove along with a stove hood above it. To the left of that is a small prep area. 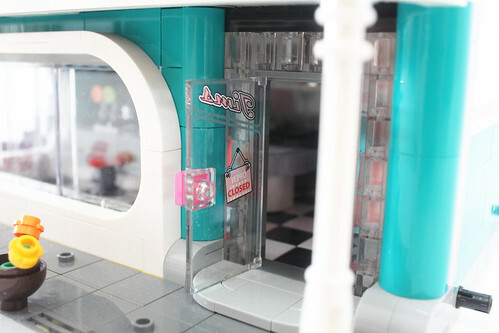 To finish it off, there’s a coffee maker as well as a soda dispenser machine. The outer windows use some new pieces and the way it is constructed, you get a smooth rounded style that shows no studs at all. 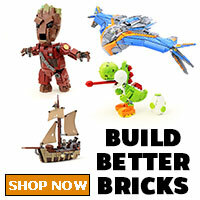 This just shows you some of the more advanced building techniques that we’ve come to expect from the Creator Expert line. Over on the sidewalk, there is a red mailbox next to a parking meter. There are also a couple of potted plants with some newer flower and stem pieces. On the side of the building, there are some stairs that lead up to the second floor. 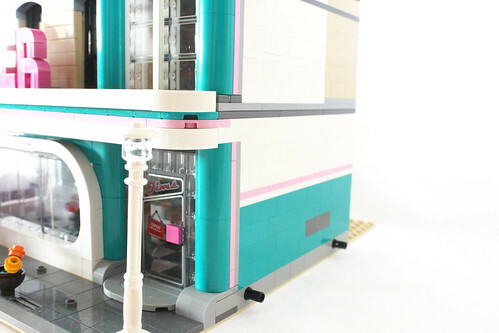 One thing you’ll immediately notice when building this lower floor is the return of the teal bricks which make up the walls of the diner. 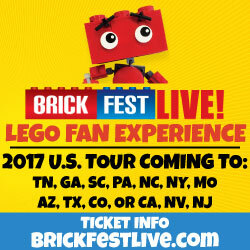 I’m sure many fans will appreciate this as well. 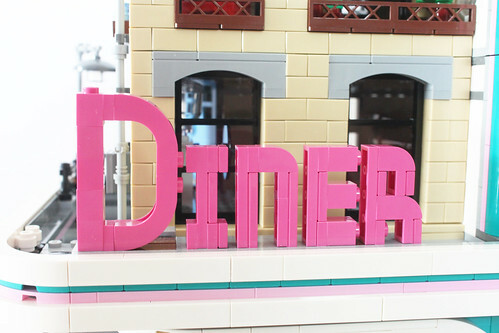 Speaking of the second floor, one of the main things that stand out is the brick-built lettering of the pink “Diner” sign. 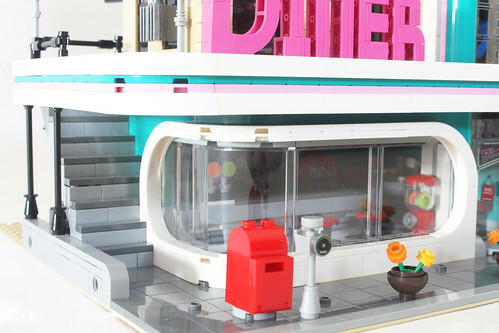 We’ve come to expect this type of lettering in the modulars and this set is no exception. The letters sit on top of the curved awning that is actually a pretty complex build. 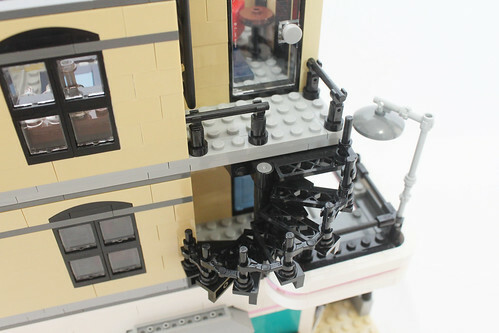 There are a couple of black columns on the side by the stairs to help hold up the structure which wraps around the windows below. 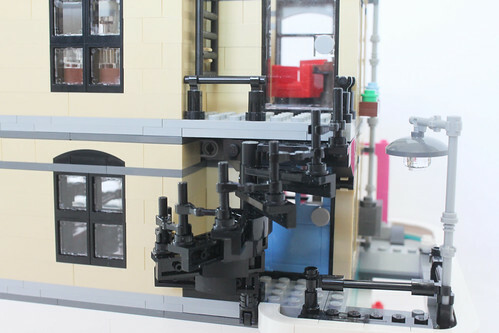 Like with the window frame on the first floor, there are no studs showing anywhere. 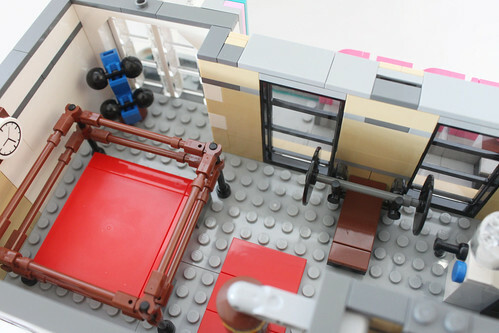 This floor is basically the gym where there are some equipment spread throughout the floor. 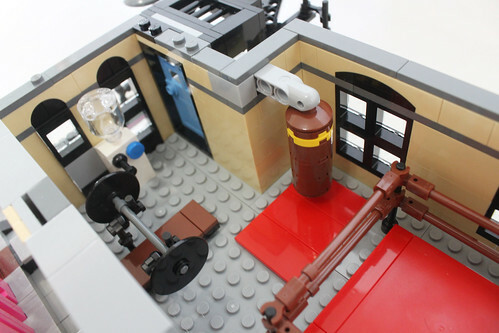 This includes a boxing ring, a punching bag, a bench press, and a dumbbell rack. 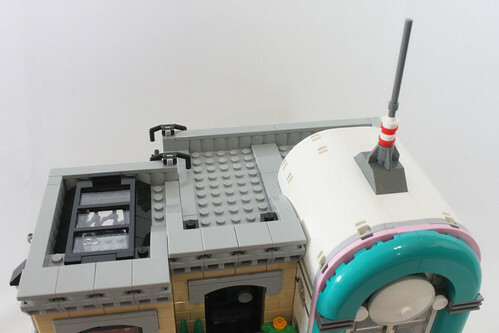 There’s even a nice model of a water dispenser as well. 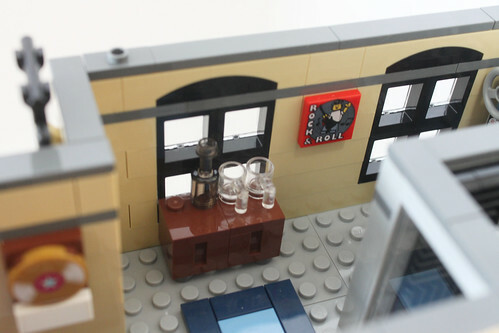 For the walls of the second floor, I do like the exposed studs on the front side which allows you to fit in some brick-built textures which is satisfying. This technique allows the outer walls to look like they’re actual wall facings. 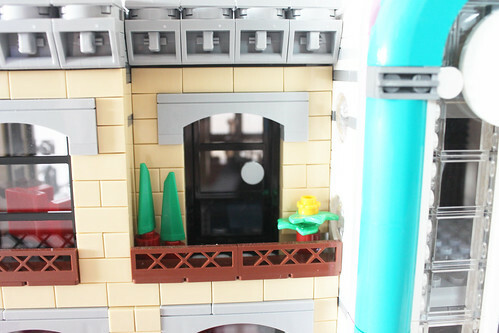 There’s also some windows on the right side that uses some curved teal bricks on either side, similar to the front door on the first level. On the backside of this floor, there’s a spiral staircase that leads up to the third floor. It has an wrought iron style and it clips on to the back wall as well as on the grate at the top of the floor. 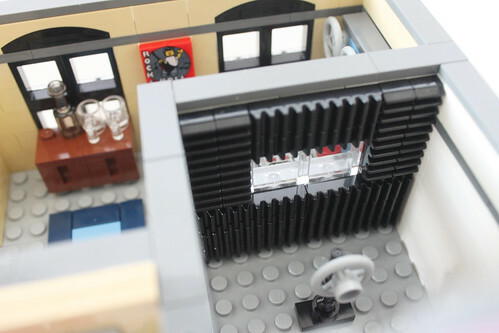 At the third floor, there’s a recording studio for the rock star and his manager. When you first start building this level, things may seem out of place and you’re just building walls with lots of holes but things come together very quickly. One thing that I do like here is the clear round windows. It basically use a couple of 1×2 trans-clear plates on a 2×2 trans-clear round shoe and are place between a couple of 1×4 arches that are stacked on top of each other. In one of the rooms of the floor is the vocal booth which uses some toothed bars on one of the walls for soundproofing foam. There’s also a microphone in the middle of the room as well. On the other side of the wall is the control room that is uses some printed pieces for the mixing console. 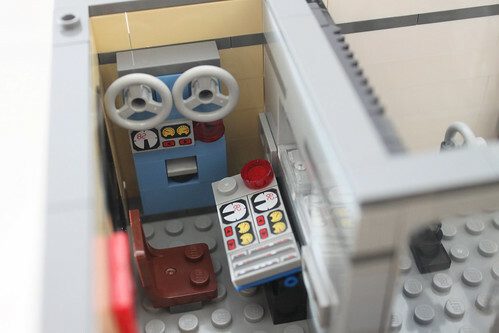 I like how the console is implemented into the wall and some of the foam pieces on the other side. The other end of the room is pretty bare with just a small table and chair however the back wall does have a refreshment bar. On the back wall is a printed 2×2 album cover as well as a gold record. 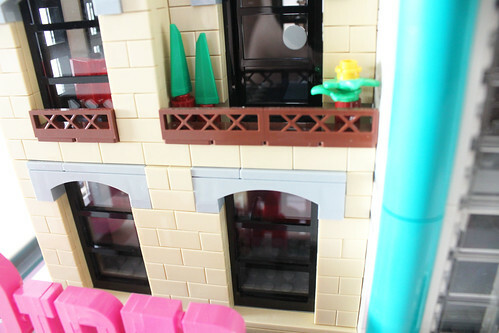 The outside of one of the front windows has a balcony which can hold some plants, one of which uses some new leaf pieces. 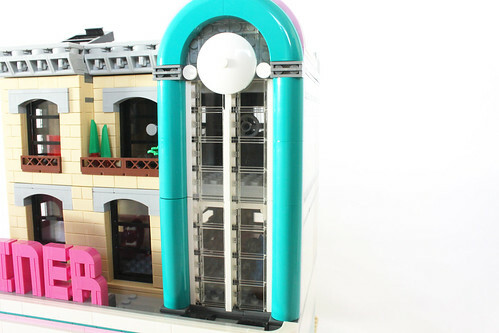 The teal columns on the right side of the wall connect with the second floor to create a large arch over the windows. Finally we have the roof which doesn’t look that interesting but does have some interesting areas to complete the look of the Downtown Diner. 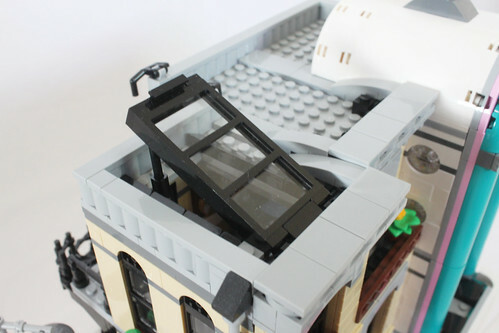 The main one is the skylight that is attached on some hinges and you can even prop it up using a bar piece. The other notable thing there is the curved dome that goes over the large windowed area of the diner. It attaches to the roof on some hinges and is integrated smoothly with the rest of the building. At the very top is a radio antenna. 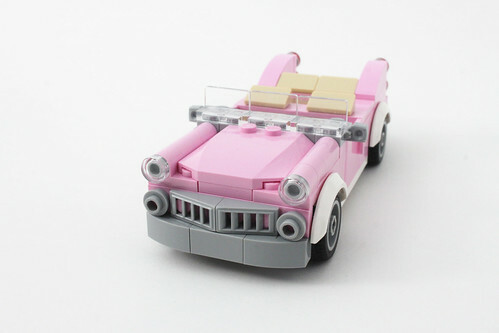 The rest of the build is for the 50’s style pink convertible. 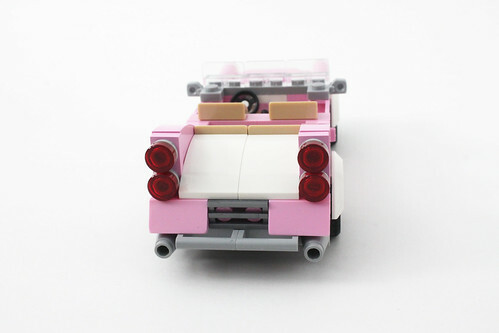 It’s a simple six wide car with the seats that are offset. 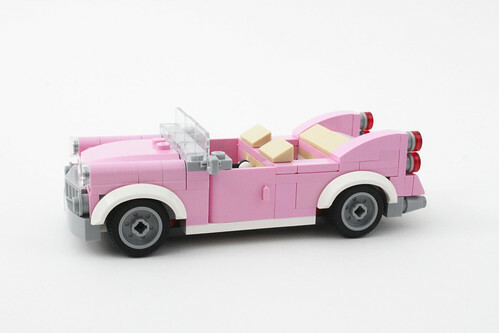 LEGO doesn’t mention what kind of car it took inspiration from but it looks like a combination of a Cadillac and a Chevy. 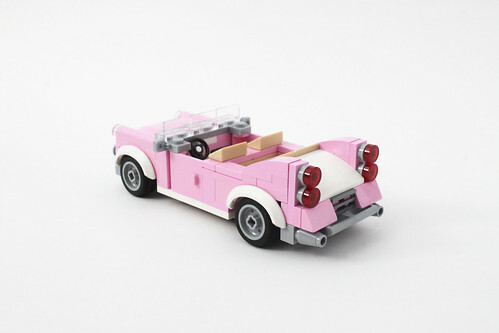 The car uses some new parts in pink including the 1×3 jumper plates with two studs and the 1×2 plate with Technic hole. 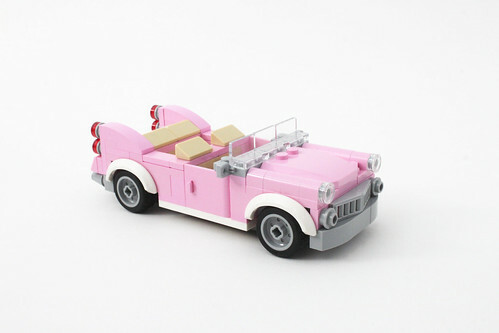 Other than that, it’s a sleek looking vehicle and one that is fit for the era the Downtown Diner comes from. 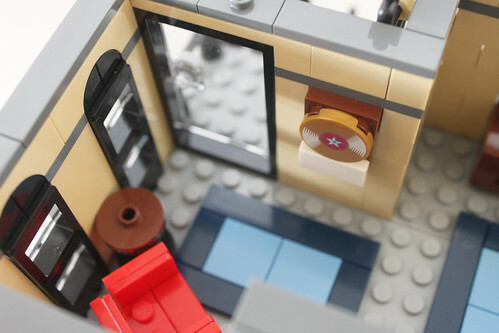 The LEGO Modular line is something that fans look forward around the end of the year when LEGO announces the next set that will be coming out the following year. 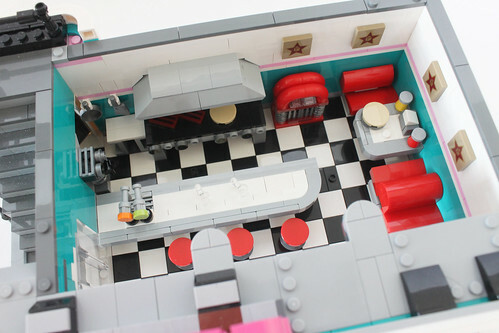 The LEGO Creator Downtown Diner (10260) has a very unique look to it and is unlike anything we’ve seen before in the Modular line however it seems that fans have embraced the change. 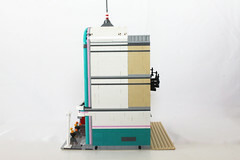 The teal used on the Streamline Moderne Art Deco design is what makes the set pop. 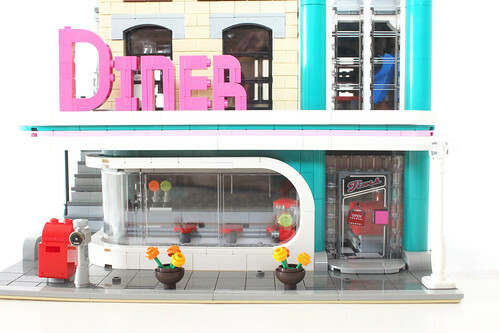 Other things that I liked about the diner was the diner section itself especially the front windows and the frame that goes around them. 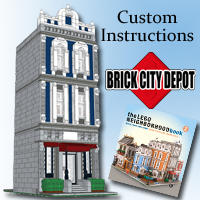 Of course, the windows and the columns on the side of the building are very eye-catching as. 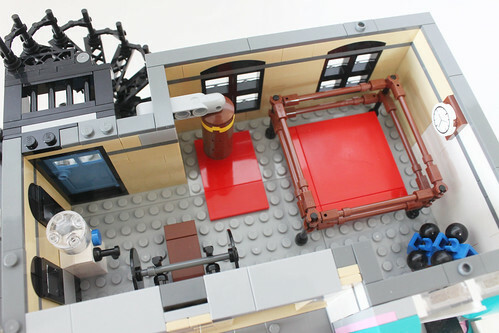 I also like the whole gym floor as well as it is packed with equipment. 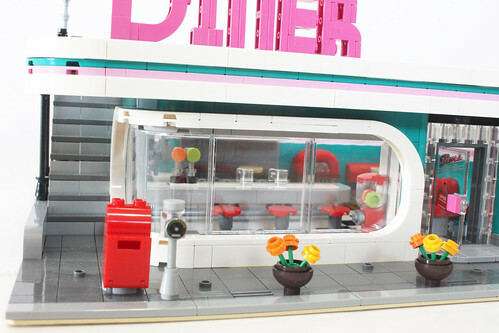 The car isn’t needed but is a welcome addition and enhances the feel of the whole retro style the diner has. The main complaint that I’ve read around the community is the change to expressive faces instead of the traditional smiley faces. 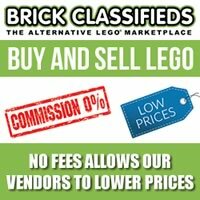 It’s been over a decade since the modulars were first released and LEGO decided to make some changes. 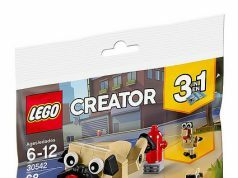 They’ve even released a statement regarding the faces and it looks like we’ll be seeing more expressive faces in future modulars. 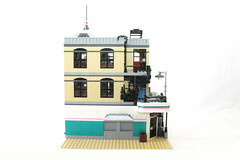 All in all, if you’re a fan of the Modular Buildings, then you’ll eventually pick this set up if you haven’t already. 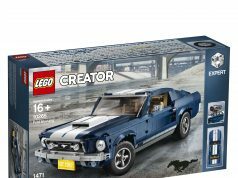 For those who are on the fence about it, I will say that it is an enjoyable build with very little downsides to it. 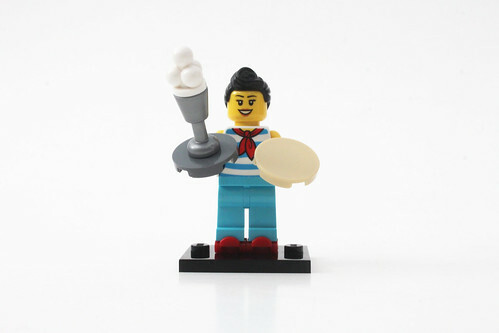 The heads on the minifigures are easily swappable if you want the usual smiley faces to match up with the rest of the modulars.